On the 2nd (Mon), take in the spiritual surroundings of Sri Maha Mariamman Temple, tour the pleasant surroundings at KLCC Park, then take a stroll through Jalan Alor, and finally explore the world behind art at Islamic Arts Museum Malaysia. 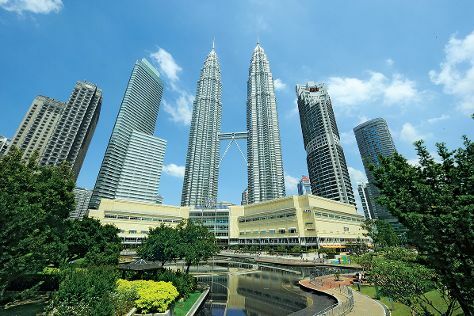 Keep things going the next day: make a trip to Merdeka Square, identify plant and animal life at KL Bird Park, Head underground at Batu Caves, then admire the striking features of Petronas Twin Towers, and finally take in panoramic vistas at Menara Kuala Lumpur. For reviews, photos, maps, and other tourist information, go to the Kuala Lumpur road trip tool . New Delhi, India to Kuala Lumpur is an approximately 8.5-hour flight. You can also drive. You'll lose 2 hours traveling from New Delhi to Kuala Lumpur due to the time zone difference. In July, daily temperatures in Kuala Lumpur can reach 38°C, while at night they dip to 28°C. Finish your sightseeing early on the 3rd (Tue) to allow enough time to drive to Melaka. 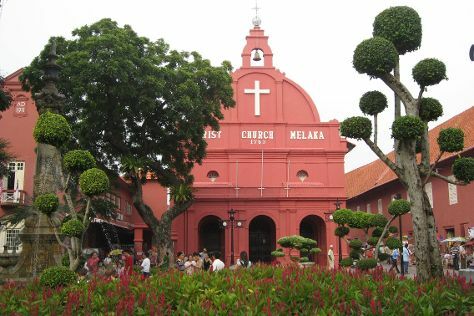 Start off your visit on the 4th (Wed): take in the architecture and atmosphere at St Peter's Church, take in the spiritual surroundings of Cheng Hoon Teng Temple, make a trip to Chinatown - Melaka, see the interesting displays at Straits Chinese Jewelry Museum Malacca, then pause for some serene contemplation at Christ Church, and finally don't miss a visit to The Huskitory. Keep things going the next day: take in panoramic vistas at Menara Taming Sari, admire the striking features of Malacca Sultanate Palace, then admire the striking features of Stadthuys, then don't miss a visit to River Walk, and finally don't miss a visit to Jonker Street. Ask Inspirock to suggest an itinerary and make planning a trip to Melaka fast, fun, and easy. Getting from Kuala Lumpur to Melaka by car takes about 1.5 hours. Other options: take a train; or do a combination of train and bus. In July, plan for daily highs up to 37°C, and evening lows to 28°C. Finish up your sightseeing early on the 5th (Thu) so you can travel to George Town. Start off your visit on the 6th (Fri): get engrossed in the history at Sun Yat Sen Museum, take in the pleasant sights at Street Art in George Town, then take in the spiritual surroundings of Dharmikarama Burmese Temple, and finally admire the striking features of Kek Lok Si Temple. On your second day here, find something for the whole family at ESCAPE. To see photos, maps, more things to do, and other tourist information, read our George Town online trip maker . Fly from Melaka to George Town in 2 hours. Alternatively, you can do a combination of bus and flight; or drive. The time zone difference moving from Malaysia Time to West Indonesia Time is minus 1 hour. In July, daily temperatures in George Town can reach 37°C, while at night they dip to 28°C. Wrap up your sightseeing on the 7th (Sat) to allow time to travel to Langkawi. Kick off your visit on the 8th (Sun): admire nature's wide array of creatures at Langkawi Wildlife Park, then Head underground at Tanjung Rhu Beach, then admire the sheer force of Telaga Tujuh Waterfalls, and finally make a trip to De'zone. Here are some ideas for day two: admire the masterpieces at Art In Paradise, then whizz through the canopy at some of the top local zipline courses and adventure parks, and then enjoy the sand and surf at Cenang Beach. For reviews, ratings, more things to do, and more tourist information, you can read our Langkawi trip planner . You can do a combination of taxi and flight from George Town to Langkawi in 1.5 hours. Another option is to ride a ferry. The time zone difference when traveling from George Town to Langkawi is 1 hour. In July in Langkawi, expect temperatures between 36°C during the day and 29°C at night. Wrap up your sightseeing on the 9th (Mon) to allow time to travel back home.